Within the first minute climbing to flying altitude, the researched facts and figures about deforestation suddenly look wrong. Nothing can fully prepare. No picture, statistic, graph or video can convey the scale of the deforestation compared to witnessing it with the naked eye. This once diverse landscape has been destroyed. Endless rows of palm plantations extend beyond the horizon. Freshly charred earth, newly cut channels and new plantations fill in the gaps. Separated by the black dividing lines of draining channels, huge swathes of brown with scattered trunks like child thrown matchsticks lie parallel to the next phase of the process, another new plantation. Accompanied by actress Melanie Laurent who is here raising her profile, the purpose of this flight is to get to Bukit Tigupuluh (Thirty Hills) national park. The Park is located just south of the equator in eastern Sumatra and one of the most important remaining lowland forests in Indonesia. The area is one of the world’s most biodiverse places and refuge for endangered species such as orang-utan , tiger, elephant, rhinoceros, tapir and many endangered birds. Within fifty years the Sumatran orang-utan population has dropped from 100,000 to less than 6,000. 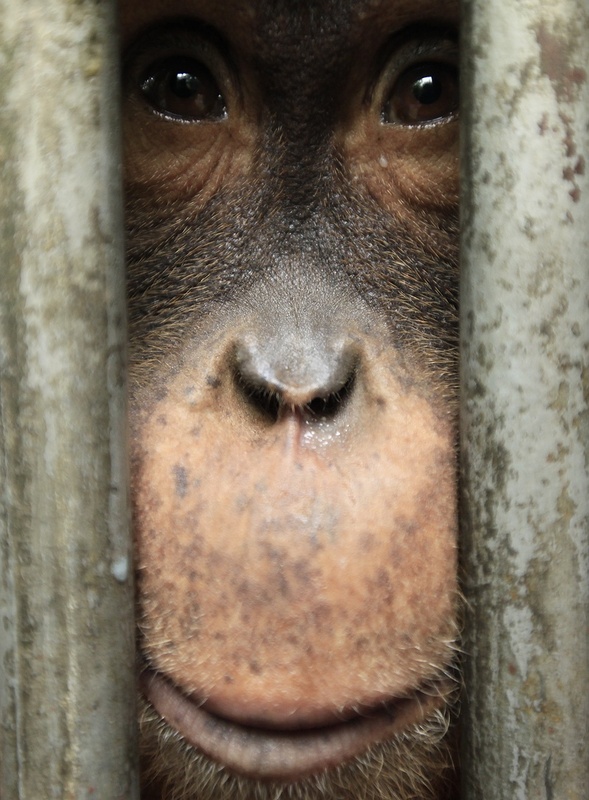 Because of the space they require to live, many fear they are now on the brink extinction. At the Frankfurt Zoological Society centre located in the park they take care of confiscated illegally held orang-utans, mostly orphans. Teaching the orang-utans to be re-introduced in to the wild, the centre also hopes it can achieve support for park authorities to safeguard the area as illegal deforestation actions continue within the park boundaries. The Sumatran orang-utan is critically endangered and according to Peter Pratje from the zoological centre, the remaining population are likely to be the first of the great ape species to be extinct. Simply, because there is nowhere left for them to go. Orang-utans are also killed as pests as their habitat disappears. Fruit crops on the forest edge become an important source of food for orang-utans forced from their habitat, unknown to them this source of food is a cash crop and costs money, money they don't have. Around two thirds of the park has been logged and it is under constant threat from continued illegal forest clearance. Once an ecosystem is destroyed it can not be rebuilt, the logging and wholesale conversion of forest to agricultural land is stripping Sumatra of it’s diversity.